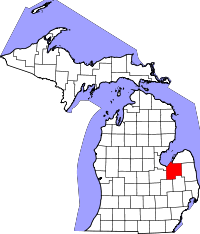 Situated in the "thumb" area of southern Michigan, Tuscola County is another one of the many renamed by Henry Schoolcraft in the mid 1800s. Tuscola is a word without a definite meaning as Schoolcraft coined a large number of the names to sound Native American without being actual Native words. Vital records for the county, indexed with the County Clerk, are available for researchers in the Genealogy research area in the Clerk office on 440 North State Street in Caro, MI. Office space provides only one researcher access to records at a time, and the office is open Monday through Thursday from 8:00AM till 4:30PM, and closed from Noon until 1:00PM for lunch. Because of the small space and limited staff, it is highly advised to call or email ahead to schedule an appointment. The County Clerk website's vital records page provides necessary application forms and associated fees.